While the scorpion is perhaps best known as a fearsome insect, it also has links to many ancient cultures and religion. Scorpions are also relatively uncommon in tattoos, so getting this creature inked on your body will ensure that you are rocking a unique and different design. Scorpions are ancient creatures that predate human existence by millions of years - they know this earth a lot better than we do! And although many people believe that scorpions are incredibly deadly, not all scorpion stings are mortal - that isn't to say you should start petting every scorpion you see, as some species are capable of killing humans with a single sting. On the flip side of this deadly sting, however, is its use for protection: its stinger is a way for the scorpion to protect itself from harm from predators and other foes. Because of this, the scorpion can also symbolize protection and defensiveness: its 'back off' stance with a stinger aimed and ready to strike makes the scorpion a prime example of how effective small animals can be at intimidation and control. 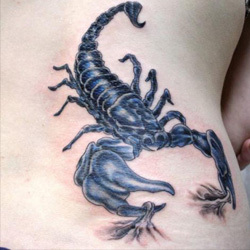 As with other animal tattoos, scorpions are often chosen for their innate qualities and characteristics. While this can include the deadly power and intimidating nature of the scorpion's stinger, this creature also has far more complex meanings. 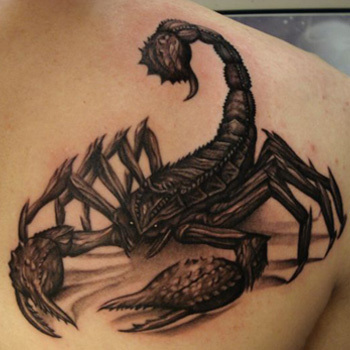 For instance, men might choose to get a scorpion tattoo because of the animal's association with sexuality and arousal. A male scorpion has a special mating dance that it performs to attract female scorpions, thus making a scorpion tattoo apropos for any man who considers himself to be a Casanova or seductive lover. Many cultures have attached significant meaning to the scorpion. For instance, ancient Egyptians associated the scorpion with the goddess Selket, the guardian of transitioning souls. In Mayan culture, the scorpion was symbolic of medicine and surgery: like the scorpion numbs its victims, so too must the surgeon. The medical connection continues in some African cultures, where the scorpion's venom was believed to have immense healing powers. In ancient Greco-Roman mythology, Diana used the scorpion to poison Orion, an act which later caused his death. Zeus then made the scorpion a constellation in the sky. It is from this tale that we get one of the most well-known meanings of the scorpion: that of a sign of the zodiac. 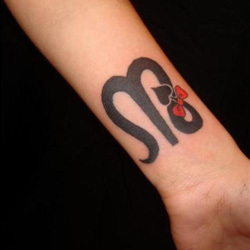 Scorpio is the 8th sign of the zodiac, and encompasses all people born between 23rd October and 21st November. Scorpios are known to be loyal, brave, focused, and intuitive, but they have some negative traits as well: they can be jealous and manipulative, short of temper and vengeful. Getting a scorpion tattoo is the perfect way to embrace your zodiac sign, and all the traits that come with it. Though traditionally more popular with men, women are also embracing the scorpion as a tattoo, and designs can be easily adapted to both men and women's tastes, and adjusted for the size of tattoo each individual wants. If you are a Scorpio, there are a variety of ways you can design your scorpion tattoo to ensure the zodiac symbolism comes across. One way would be to get the constellation itself - this series of stars can be on a midnight blue or black night sky background, or they can simply be on their own. One interesting design possibility would be to get a larger sky-scape tattooed on your back or other part of your body, with the stars making up the Scorpio constellation inked much more brightly than the surrounding stars. This would be a great choice for a Scorpio who also happens to be a lover of astronomy, or for a Scorpio who appreciates the beauty of the night sky. With constellations, the stars themselves are often just rough outlines of the people, creatures, or things they represent. It might be helpful to 'fill in the gaps' so that the scorpion connection is clear; this can be done in a variety of ways, such as by outlining the shape or superimposing a scorpion on top of the stars, so work with your tattoo artist to see what works best for you. If you want the scorpion to be at the forefront of your Scorpio tattoo, you can design the animal according to your preference and then have 'Scorpio' or your birthdate written below or around the animal. If simplicity is the name of the game, you can simply get the astrological symbol for Scorpio - an 'M' with an arrow coming off from the bottom - instead of a complex constellation or creature design. Another popular scorpion tattoo design is that of a stinging scorpion. This tattoo can symbolize a few different things: when poised and ready to strike, a scorpion can be lethal and deadly, and should thus be avoided at all costs. Emphasize these qualities by giving the scorpion a fearsome stare, or by having the venom beginning to drip from the stinger. This type of design lets others know that you are always ready for an attack, and that you can be incredibly resourceful in defeating enemies or foes that are much bigger and stronger than yourself. On the flipside, this stinging stance can also indicate vulnerability and defensiveness. It might be worth reflecting on what some of your greatest fears are, or why exactly you might feel vulnerable or on the defensive. Consider incorporating these fears or enemies into the tattoo design as well, either literally or symbolically, to give yourself a daily reminder of your fears in order to overcome them. The scorpion is a sign of inner strength, and whether you find yourself on the offensive or defensive, having its stinger raised in your tattoo design will let others know that you are strong and not to be underestimated. The scorpion is becoming a popular tattoo for men and women alike, and the variations of designs can ensure that your tattoo is unique and suited to your personality. Consider playing with color and the overall scene in which the scorpion is situated in so as to have an even more customized and individual design. For custom design of a Scorpion, you can check our Custom Tattoo Page.